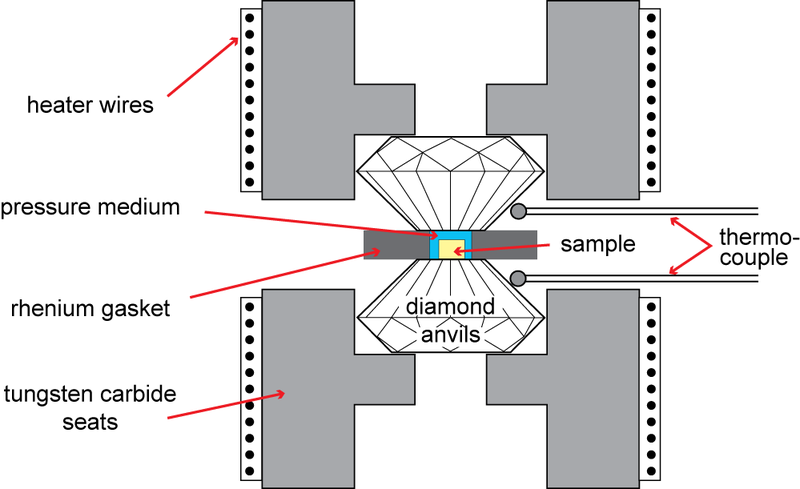 The heart of a diamond anvil cell. Click for larger image. 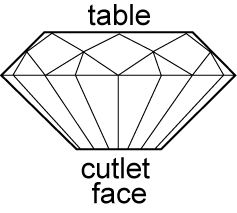 The diamond anvil has a table face, which is where a force is applied and a smaller cutlet face where anvil puts force on the sample. Click for larger image. The diamond anvil cell (DAC) is the most versatile and popular device used to create very high pressures. 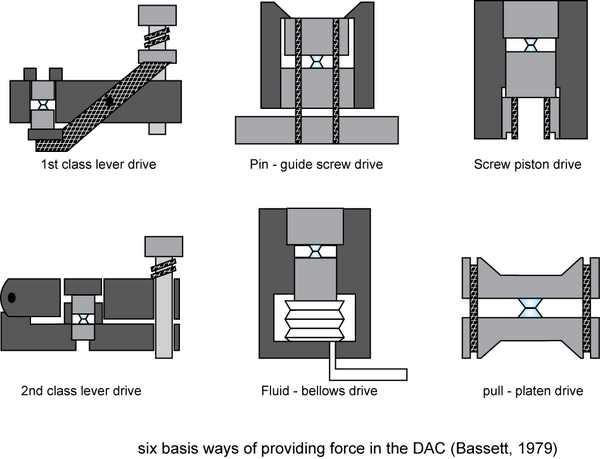 The DAC is a member of a class of high pressure devices called opposed anvil devices; it creates high pressures by trapping a sample between tiny flat faces ground on the pointy ends of two diamonds (cutlet faces). A modest force applied across the wide "table" face of the diamond can generate tremendous pressure on the small "cutlet" face. A generalized diamond anvil cell assembly with components annotated. Click for larger image. 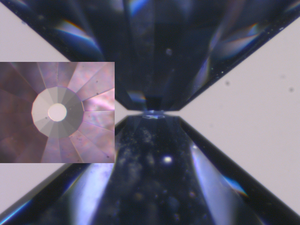 The simplest DAC experiment can consist of nothing more than a powdered sample, the diamonds, and the small frame which holds the diamonds together. However, most experiments are considerably more sophisticated. Pull-platen DAC. Click for larger image. Photograph by Dr. Barbara Lavina and Dr. Pamela Burnley at UNLV. Typically ½ - 1 carat in size, the diamond anvils must be flawless. The three most common cuts used for anvils are a modified brilliant cut, drukker standard cut, and Boehler - Almax cut, which are all similar to a classic cut solitaire. The difference between an anvil and a diamond cut for jewelry is the small cutlet face where the point would normally be. Some researchers are starting to use "designer" anvils which have specialized shapes or in which electrical leads are incorporated into the anvils. Touching beveled culet anvils. The inner culet is 100um, with 8-degree bevel out to the 300um outer culet. The inset shows the view looking down on one of the anvils. These anvils can go to the highest pressures; >100 GPa. Click for larger image. Samples that can be examined using the DAC include both solids and liquids and can be virtually anything that won't damage the diamond faces. Since diamonds are quite inert, a wide range of substances may be examined. As mentioned above, the simplest sample consists of a powder trapped between the two anvils. Once compressed, such a sample will generally become a circular film about 30μm thick. The center of the sample will be at high pressure. However, because the edges of the sample are at 1 atmosphere, there is a tremendous pressure gradient within the sample. The pressure at the center of the sample is supported by extreme shear stress within the sample and friction between the sample and the diamond face. This arrangement does not work well for samples that cannot support shear σ (e.g. liquids) or for research questions where a sample needs to be in a quasi hydrostatic stress state or if the defect microstructure is important. Since many physical properties are impacted by defect microstructure and the state of stress, many early studies were marred by this drawback. To alleviate the stress in the sample and to preserve the defect state of sample, gaskets and confining media are now frequently used. The size of DAC samples is of necessity very small. This presents some logistical challenges loading them into the cell. At this size, the electrostatic attraction of surfaces is much greater than gravitational attraction. Thus samples can be manipulated by adhering to the tip of a fine needle or fiber. However, if it encounters static charges enroute to the cell, the sample can also suddenly fly off, never to be seen again. Loading a DAC requires a good binocular scope and a very steady hand. The gasket is a thin sheet of material that has a small hole about ½ diameter of the cutlet face – typically <500 microns. The gasket is used to contain the sample, especially if the sample is composed of or surrounded by a fluid. The steep pressure gradient discussed above is contained in the gasket which spares the sample. 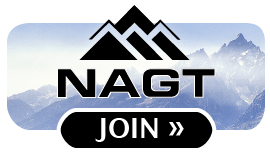 Gaskets are typically prepared by driving the diamonds into a thin sheet metal and then drilling a tiny hole through the indented portion of the gasket. Rhenium is commonly used for the gasket, but Kapton, Cu, Be are also used. 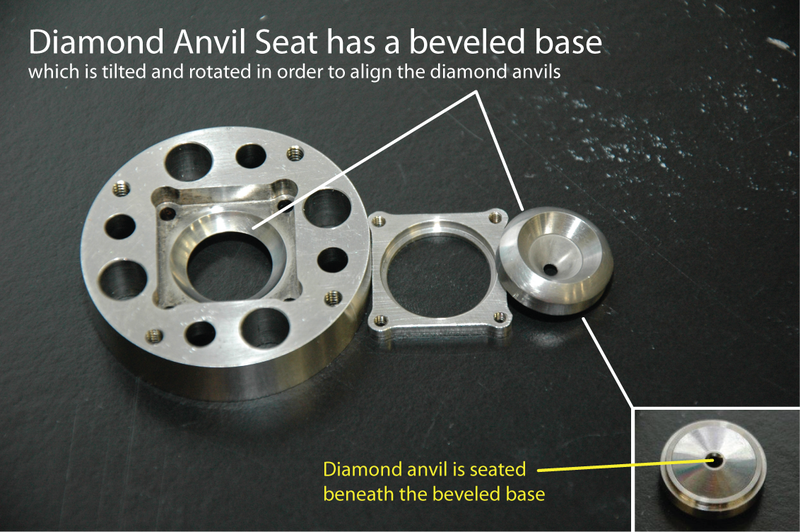 The beveled edge between the backing plate and diamond seat which can be rotated and tilted in order to align the two diamond anvils. Click for larger image. 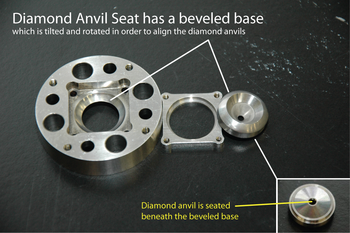 The diamond anvils sit on "seats." The seats must be made of a strong material as they transmit the load from rest of the cell to the diamonds. If the DAC is heated the seats must be resistant to creep at high temperatures. Depending on the application the seats may also need to be x-ray transparent. In some cell designs, the seats may be mounted on half spheres or another mechanism that allows their orientation to be adjusted so that the faces of the opposing anvils are perfectly parallel to each other (figure 2). If the anvils are not perfectly aligned very high stresses can occur in the diamonds that will probably cause the anvils to fracture. Cell designs are as diverse as the types of experiments that are conducted in them. There are cells specialized for room temperature, cryogenic or heated experiments, ultra high pressure, radial or axial diffraction, spectroscopic studies, fluid studies etc. The cell keeps diamonds positioned and allows the experiment to be mounted on anything from an optical microscope to a synchrotron beam line. Cell bodies may include circulating gas to cool the diamonds or have ports to allow light, or x-rays etc. to pass through sample. All cells also contain a pressurizing mechanisms. The vast majority of DAC cells can be held in a single hand if not the palm of one's hand, thus DACs are very portable and relatively inexpensive to manufacture. The pressurizing mechanism is simply a means of adjusting the distance between the diamonds and keeping them in that position. In its simplest form the pressurizing mechanism can be a screw or several screws. It usually involves springs to apply constant force to the diamond anvil seats. If pressure control must be managed remotely (e.g. at synchrotron) the springs may be replaced by a motorized pressure control or membrane control. Six pressurizing mechanisms. Click for larger image. The role of confining media is to transmit pressure to the sample while minimizing the shear stress transmitted to the sample. Weak solids and liquids are typically used. "Gasses" such as Ne, Ar, or N2 are a highly desirable confining media. However, in all cases they are loaded into the cell in a liquid state since the high compressibility and low density of material in a gaseous state renders true gasses useless as a confining media. Depending on whether the confining media is in a liquid or solid state they are more or less successful at protecting samples from stress. Liquids provide true hydrostatic environment. However, many fluid media crystallize as pressure increases; thus a media that works well at lower pressure may crystallize and introduce error at high pressures. Common confining media include LN2, Ar, He, ethanol, methanol and NaCl. Video monitor showing DAC sample with ruby spheres (above) and the graphical interface for HPCAT's ruby fluorescene system showing ruby R-lines. Click for larger image. Although in theory, one should be able to calculate the pressure in the DAC by knowing the force applied to the table face, the area of the table face and the area of the cutlet face. An unknown amount of force is dissipated by flow in the gasket and the sample. Thus an internal pressure standard is required. 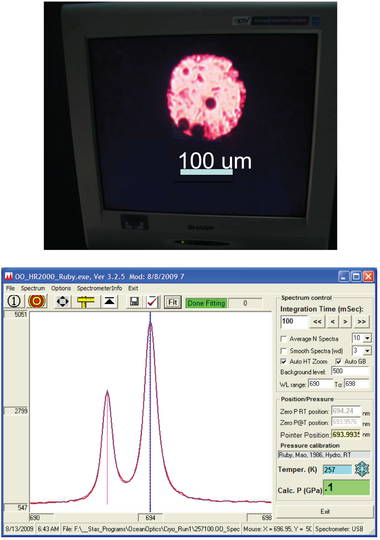 The majority of DAC studies utilize one of two strategies for pressure measurement: 1) Measuring the unit cell size of a material whose Equation of State is well known or, 2) Measuring the position of the fluorescence lines of Ruby or YAG, the positions of which are known as a function of pressure. Ruby fluorescence is very commonly used for pressure measurement. Ruby is chemically inert, has strong fluorescence when hit with a green laser light, and it can now be purchased in the form of small spheres created precisely for this purpose. The disadvantage of ruby is that when it is heated the it's fluorescence peaks broaden and decrease in intensity to a point just above 400°C where their position can no longer be measured. There are methods for using YAG which fluoresces to some what higher temperatures, but in general fluorescence cannot be used in heated experiments. Another strategy for pressure measurement is to use x-ray diffraction to measure the lattice spacing of a material for which the EOS is known as a function both pressure and temperature. This technique can be used at high temperature as well as low temperature. The disadvantage of using an EOS is that it requires access to an x-ray source, and the measurement time is typically longer, but the advantage is that it is potentially more precise than using fluorescence methods to determine pressure. For equation of state measurements by diffraction from a sample, both are used; fluorescence to determine approximate pressures when changing pressure, and the EoS of a standard to determine precise pressures while also measuring the sample. The accuracy of pressure measurements are limited by how well EOS of the chosen pressure standard is known, the uncertainty in temperature measurement and distortions in the lattice of the pressure standard caused by non-hydrostatic stress in the sample. Studies of multiple diffraction standards run in the same experiment have shown disagreements between common diffraction standards on the order of 10%. Commonly used pressure standards include Au, Pt, and MgO. Two methods are employed for heating DAC experiments: resistance heating and laser heating. A generalized diamond anvil cell assembly with components. Click for larger image. Resistance heating is accomplished by heating part or all of the DAC by flowing a current through a material that heats when electricity flows through it. A classic design is to wind NiChrome wire around the exterior of the diamond seat. Some designs heat the entire body of the DAC and other designs flow current through the gasket material. In air temperatures for resistance heating are limited to ~600°C by the oxidation of the diamond anvils. DACs that have been designed for Ar-H flow around the diamonds during heating can get to ~1000°C at which point creep (ductile deformation) in the diamond seats and cell body become an issue. Diagram of double sided laser heating system at HPCAT. X-rays enter from the right detector as shown at the far right. Diffracted x-rays are at far left and are indicated with dashed lines. Click for larger image. 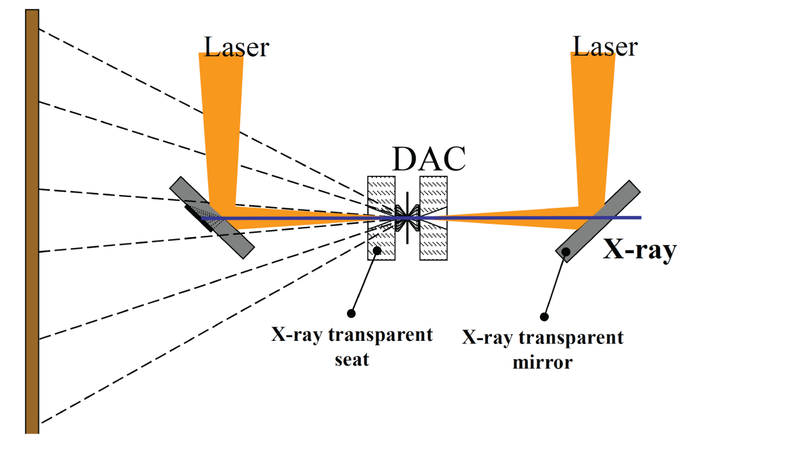 Many problems of interest for DAC require much higher temperature thus laser heating techniques have been developed. 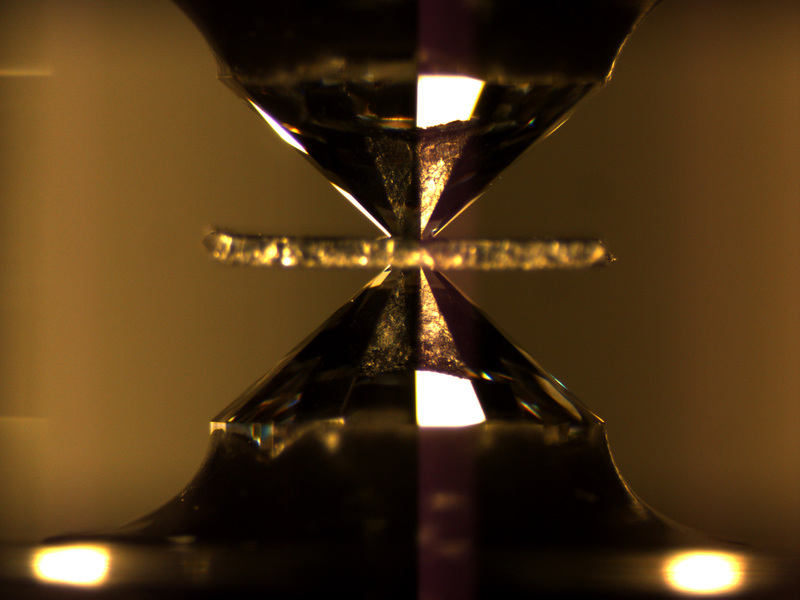 Diamonds are transparent to all wavelengths of visible and infared light, therefore lasers will pass through diamonds without depositing any energy. If a material that absorbs the laser's light is incorporated into the sample the sample can be heated locally to extremely high temperatures (3500°K at 30GPa!). Typically Nd YAG and CO2 lasers are used for laser heating. The disadvantage of laser heating is that the temperature is only produced where the laser hits the sample. The cell and gaskets remain at room temperature or close, thus, there are tremendous temperature gradients within the sample. To alleviate the temperature gradient between the side of the sample facing the laser and the opposite side, double sided laser heating has been developed. The most commonly used technique for measuring temperature in everything from your kitchen oven to a DAC is a thermocouple (http://www.explainthatstuff.com/howthermocoupleswork.html). Thermocouples are generally mounted as close to the cutlet face of the anvil as possible. For resistance heated DAC, the high thermal conductivity of the diamond ensures that the temperature difference between the thermocouple bead and the sample is less than 5-10 °C at low temperature, but increases as temperature increases. In some cases the thermocouple may be mounted on both anvils to improve accuracy of temperature measurement. In laser heated experiments a thermocouple would be of little use because the high temperature spot is highly localized within the sample. Instead optical spectroscopy is used to measure the black body radiation directly from the hot spot. 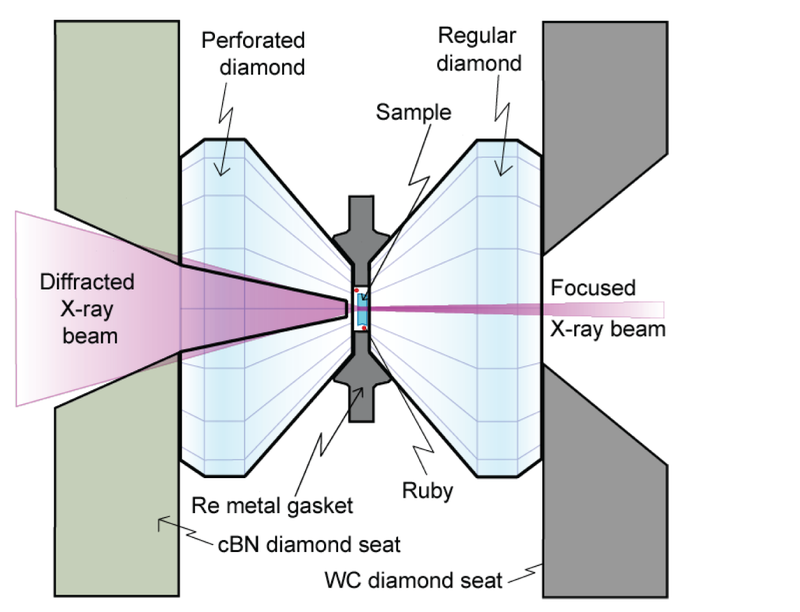 One of the tremendous advantages of the DAC over many other high pressure techniques is that the diamond anvils are transparent to so many forms of radiation. The sample may be viewed at pressure and temperature using an optical microscope. Lasers, of various wavelengths, may be used to measure optical Raman, Brillouin, or IR spectra. X-rays may be used to measure nuclear resonance scattering and diffraction from both single and polycrystals. Magnetic properties may also be measured as well as sound speed. Thus much of what we know about the physical properties of materials at pressures above 26 GPa comes from DAC experiments. 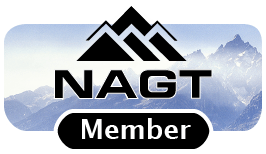 Because of the transparency of diamonds portability and wide range of pressures and temperatures discussed above DACs are used to make a wide variety of measurements relevant to geosciences. DAC has been used to measure melting of Fe at conditions of Earth's core and used to describe and characterize high pressure phases present only in the interior of planets and stars. 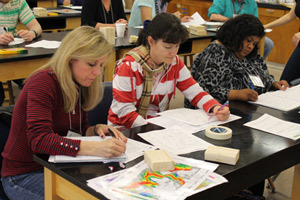 they are used to measure the equation of state of earth materials, including solids and liquids. They have been used to conduct phase equillibria experiments and to measure a wide variety of transport properties. There are some drawbacks to DACs, which are primarily related to the small size of the sample chamber (~30µm-500µm). The topic of non-hydrostatic stress was raised several times earlier. If the sample touches both anvils very high shear stress can be introduced into the sample. These high stresses create at minimum, uncertainty in pressure measurement, change the thermodynamics state of the sample, and introduce defects due to deformation of the sample. Even if the sample does not "bridge" the anvils if the confining medium is solid, some level of stress may be transmitted to the sample. These stresses and failure to account for them are probably the biggest source of uncertainty and conflicting results in DAC experiments. A variety of material properties are related to the way individual crystals are arranged relative to each other in a specimen. Some are dependent on grain size. Others depend on chemical exchange between domains of different chemical composition. The small size of the cell places severe constraints on experiments designed to study these properties. However, for many kinds of experiments that need to be conducted at pressures exceeding ~25 GPa there is no other options. In addition, advances in nano fabrication and precision micro characterization of specimens address many of these shortcomings. 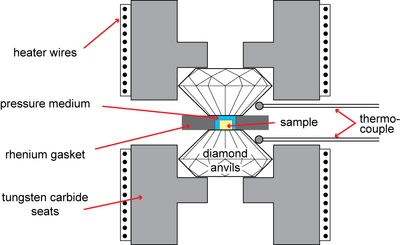 Eremets, M., 1996, High Pressure Experimental Methods, Oxford University Press, 389 p. Chapter 3 "Diamond Anvil Cell". Bassett, William A., 2009, Diamond Anvil Cell, 50th Birthday, High Pressure Research, vol. 29, n. 2, p. 163-186. Bassett, William A., 1979, The Diamond Cell and the Nature of the Earth's Mantle, Annual Reviews in Earth and Planetary Science, vol. 7. 357-384. These materials are being developed with the support of COMPRES, the Consortium for Materials Properties Research in Earth Sciences, under NSF Cooperative Agreement EAR 10-43050 and is partially supported by UNLV's High Pressure Science and Engineering Center, a DOE NNSA Center of Excellence supported under DOE NNSA Cooperative Agreement No. DE FC52-06NA26274. 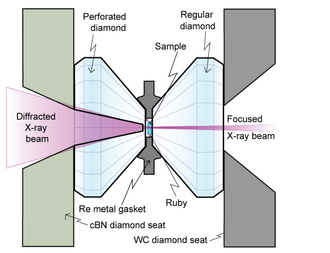 Mei, Q., Singogeikin, S., Shen, G., Amin, S., Benmore, C.J., and Ding, K., 2010, High-Pressure x-ray diffraction measurements on vitreous GeO2 under hydrostatic conditions: Physical Review volume 81, issue 17, p.
Burnley, P.C., and Schmidt, C., 2006, Finite Element Modeling of Elastic Volume Changes in Fluid Inclusions: Comparison with Experiment: American Mineralogist, v. 91, p. 1807-1814.